"Finance careers open doors. You might not always want to walk through them, but they will be there. Look out for them". 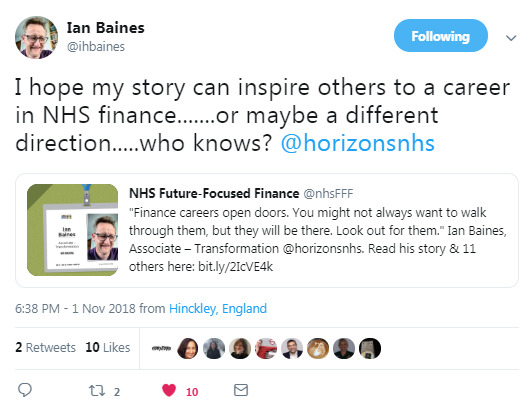 Ian shares his career story to inspire others. 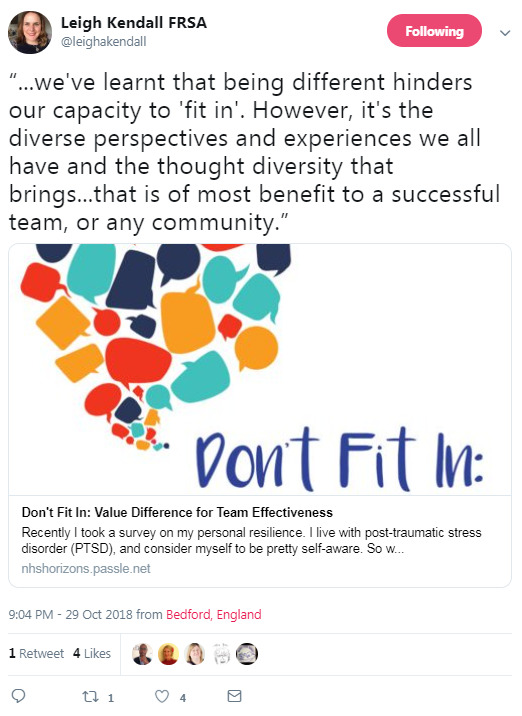 Leigh wrote Don't Fit In: Value Difference for Team Effectiveness "We've learnt that being different hinders our capacity to 'fit in'. 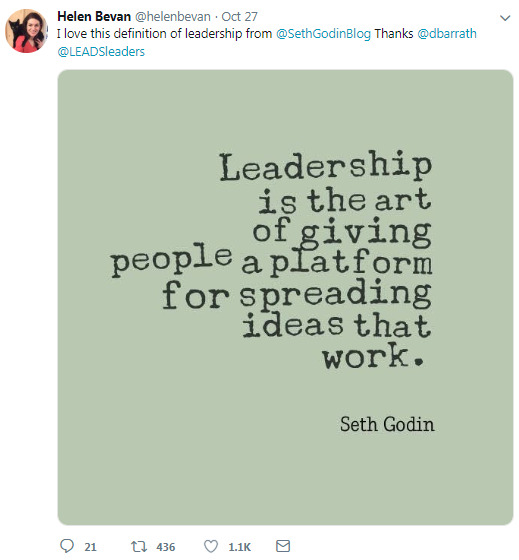 However, it's the diverse perspectives and experiences we all have and the thought diversity that brings.... that is of most benefit to a successful team, or any community." 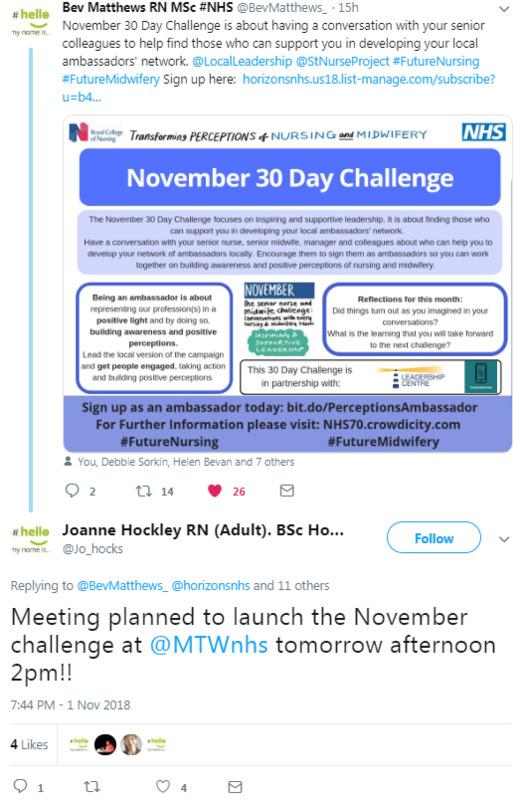 The November 30 Day Challenge is about having a conversation with senior colleagues to help find those who can support you in developing local ambassadors' networks. You can sign up to become an ambassador. Jo has already set up her meeting! 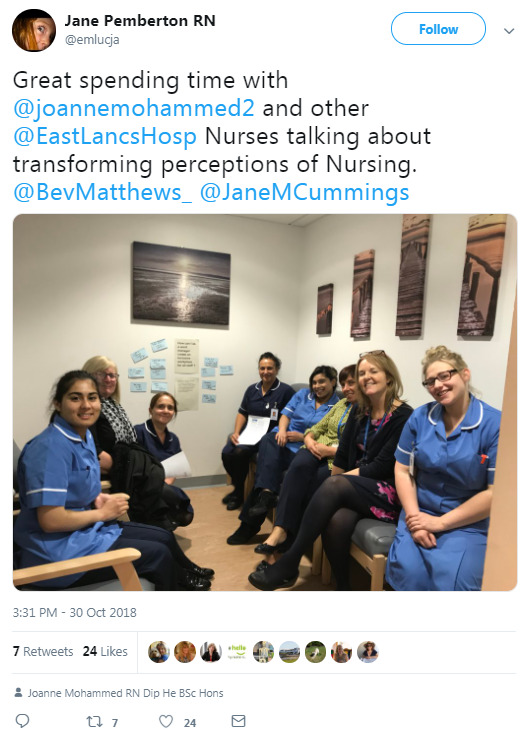 Jane and Joanne have been working on developing the ambassadors' network in East Lancashire Hospitals. 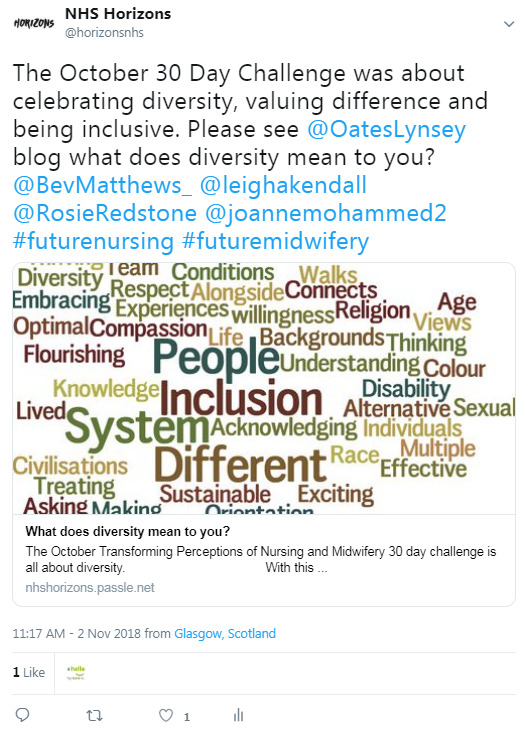 What does diversity mean to you? 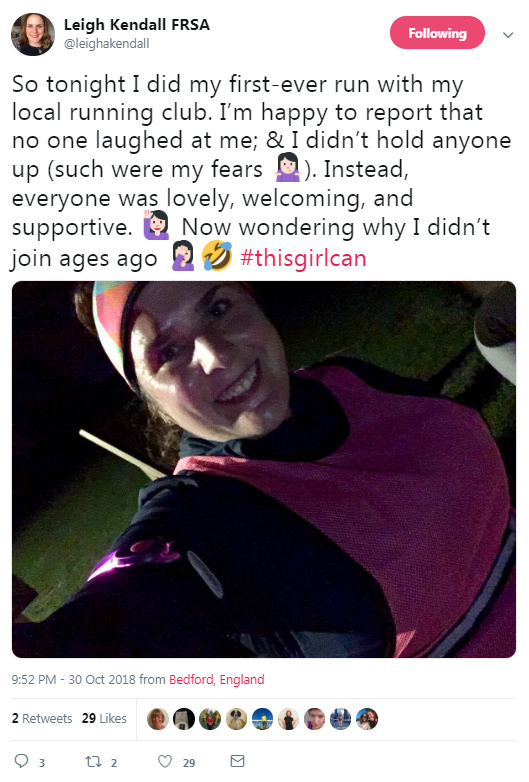 Lynsey shares her reflections on the October challenge. 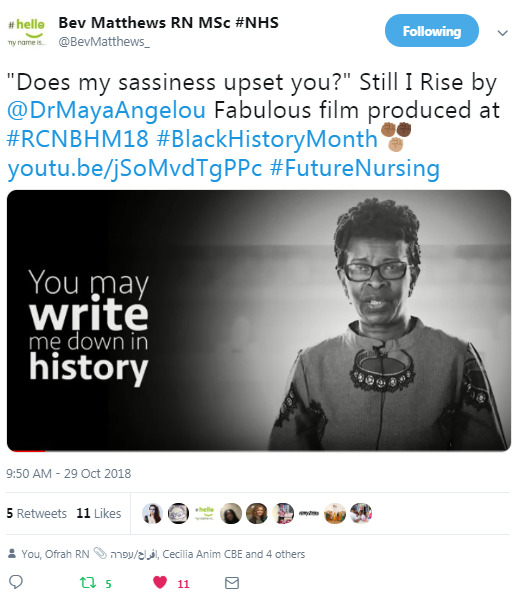 Still I Rise by the late Dr Maya Angelou was created t the Royal College of Nursing Black History Month 2018 celebrations. 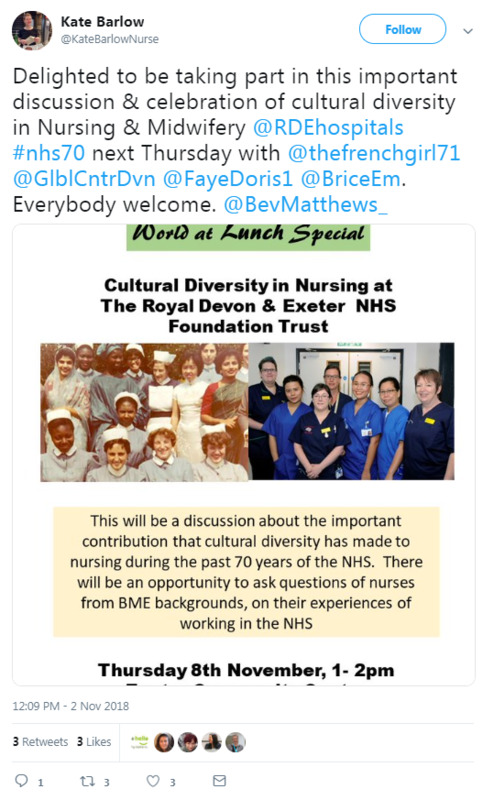 Ambassador Kate is planning a discussion and celebration of cultural diversity in nursing and midwifery for the October 30 Day Challenge. 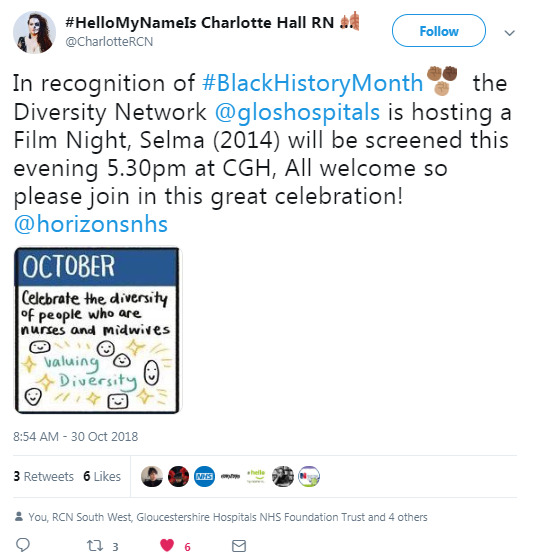 Charlotte shares that, in recognition of Black History Month, the Diversity Network at Gloucestershire Hospitals NHS Foundation Trust hosted a film night, Selma (2014). 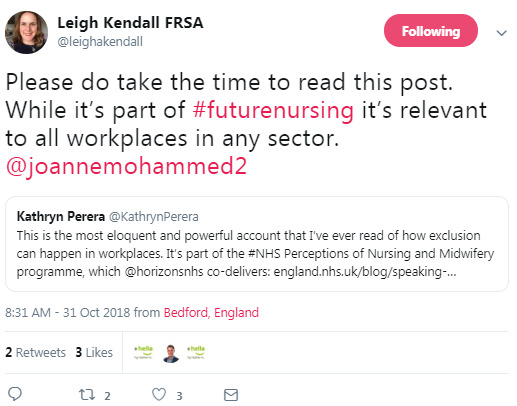 Ambassador Joanne Mohammed wrote an incredible blog about how exclusion can happen in workplaces as part of the October challenge (we shared this in last week's tweets of the week; it's so good it bears repeating!). 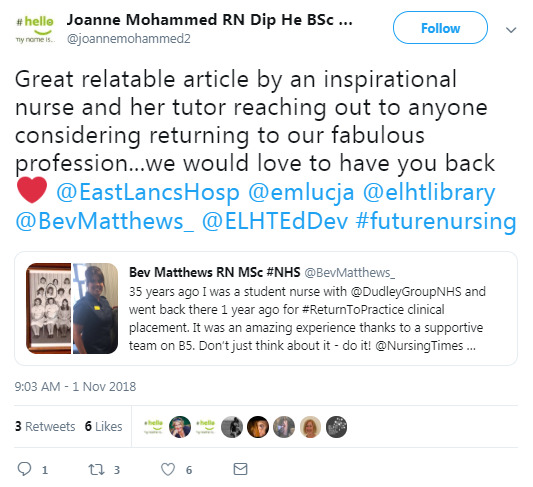 "Resilience means building our support structures, having a voice, feeling as if we are listened to, being able to develop better ways of working and having access to learning and development opportunities to build confidence." 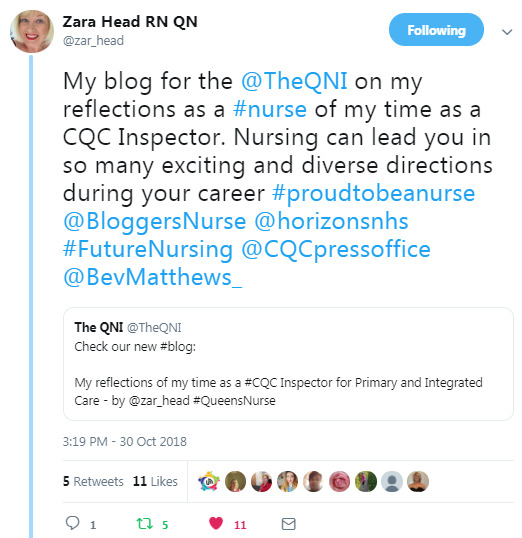 says Zara Head in her reflections of her time as a CQC inspector. 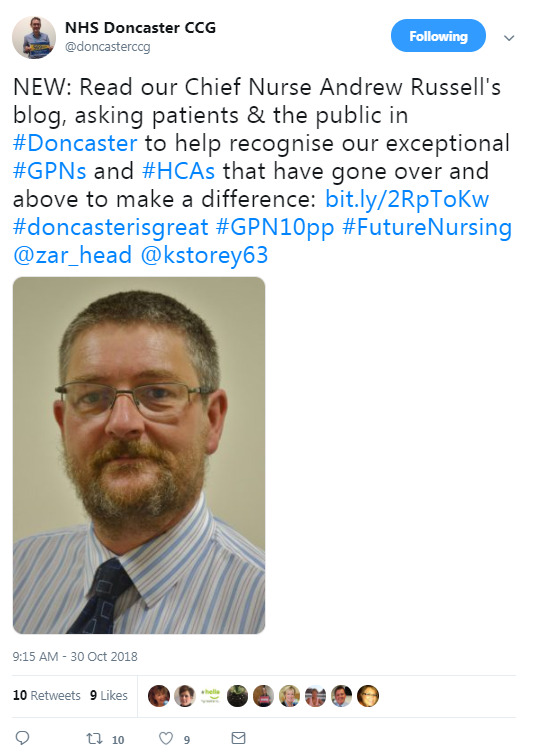 Chief Nurse Andrew Russell has written a blog asking patients and the public in Doncaster to help recognise their exceptional general practice nurses and health care assistants that have gone over and above to make a difference. 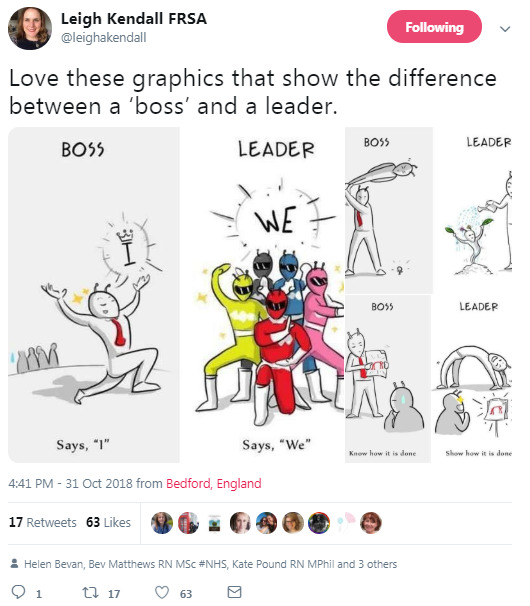 This fantastic graphic shows the difference between a 'boss' and a leader. 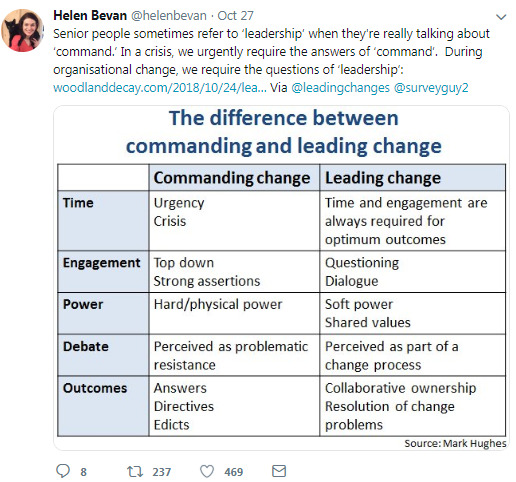 Senior people sometimes refer to 'leadership' when they're really talking about 'command'. In a crisis, we urgently require the answers of 'command'. During organisational change, we require the questions of 'leadership'. According to Dr Mark Hughes. Warmth is a much-needed but often underestimated trait in leaders. 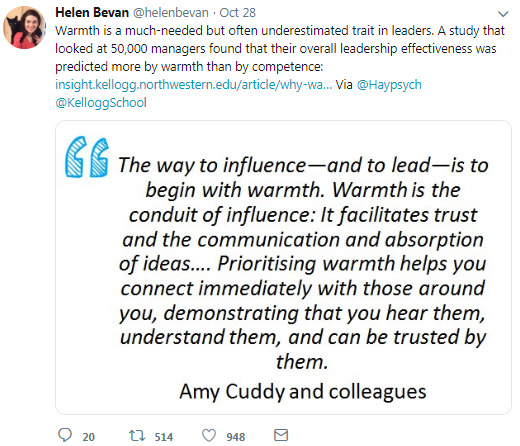 A study that looked at 50,000 managers found that their overall leadership effectiveness was predicted more by warmth than by competence. 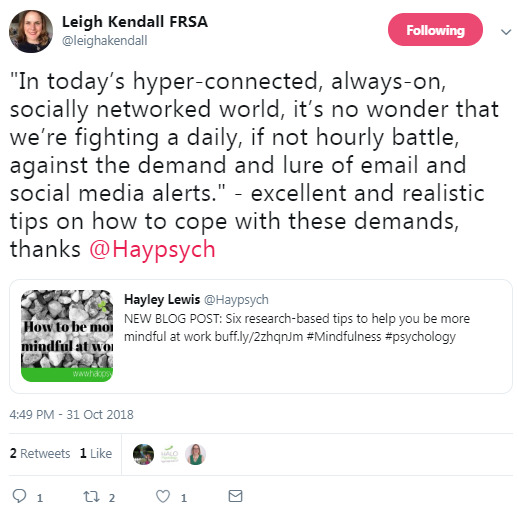 "In today's hyper-connected, always-on, socially networked world, it's no wonder that we're fighting a daily, if not hourly battle, against the demand and lure of email and social media alerts." Here are some tips on how to cope with these demands. 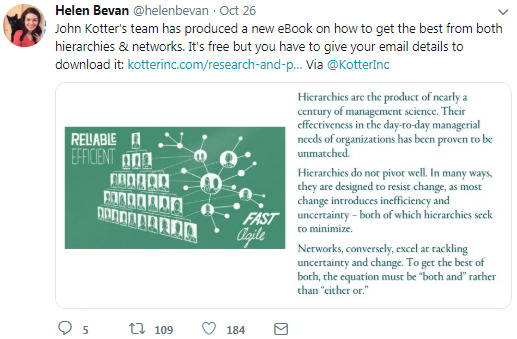 John Kotter's team has produced a new eBook on how to get the best from both hierarchies and networks. People who find meaning in their work are happier, more engaged and more productive. 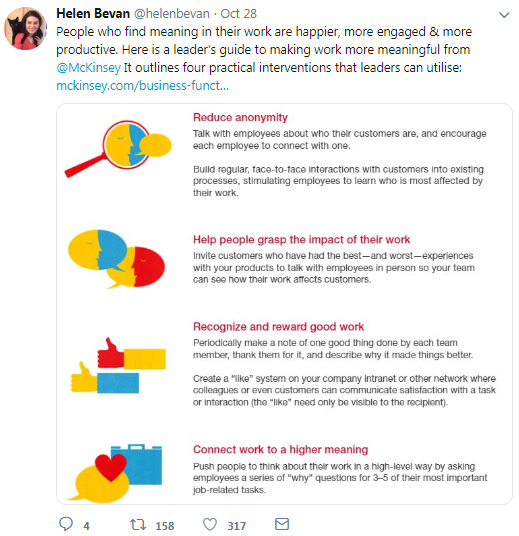 Here is a leader's guide to making work more meaningful from McKinsey. Are you sometimes bad at saying "no"? 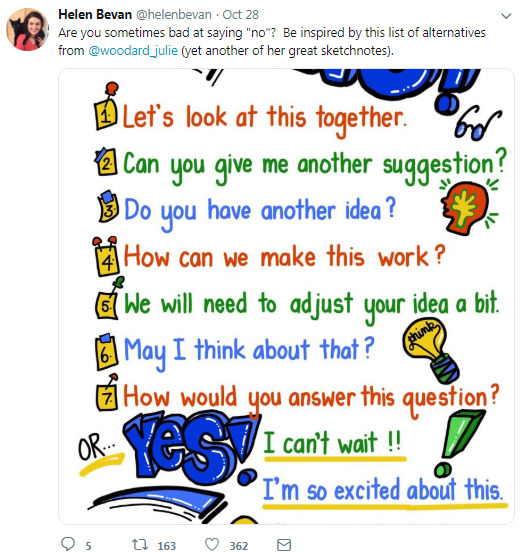 This is an inspirational list of alternatives by Julie Woodard. 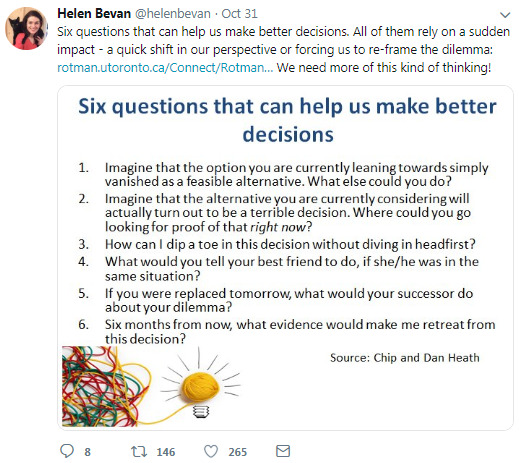 Six questions that can help us make better decisions. All of them rely on a sudden impact - a quick shift in our perspective or forcing us to re-frame the dilemma. Facing your fears and finding what really makes you happy can help you on your journey to find joy in your personal life and at work. 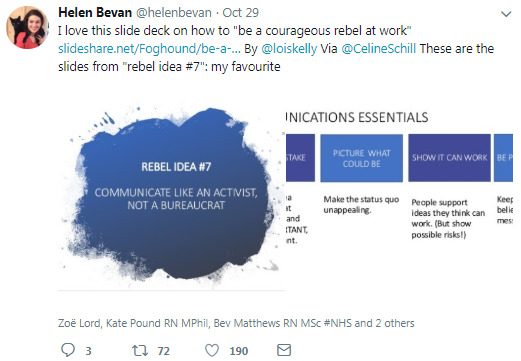 This slide deck is on how to "be a courageous rebel at work". 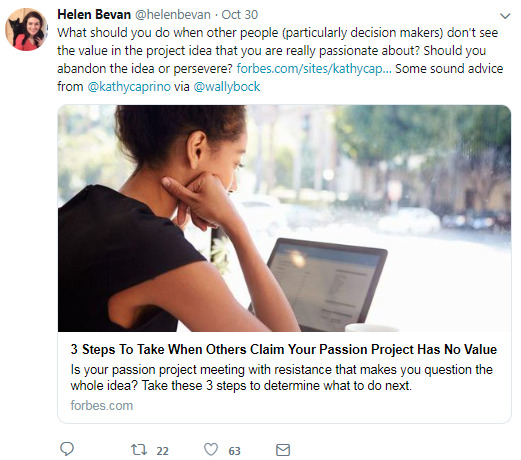 What should you do when other people (particularly decision makers) don't see the value in the project idea that you are really passionate about? Should you abandon the idea or persevere? Here is some advice form Kathy Caprino. 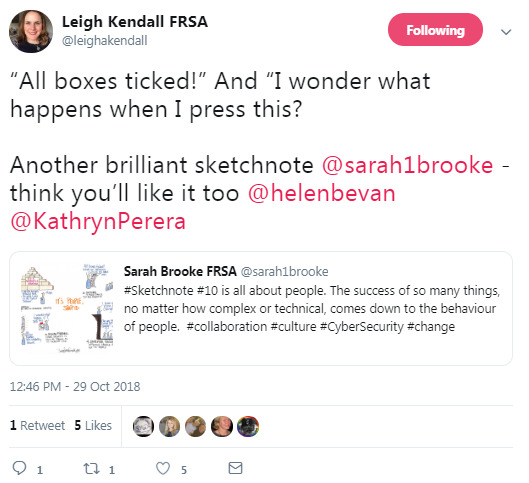 This sketchnote shows that the success of any sort of change comes down to the behaviour of people. 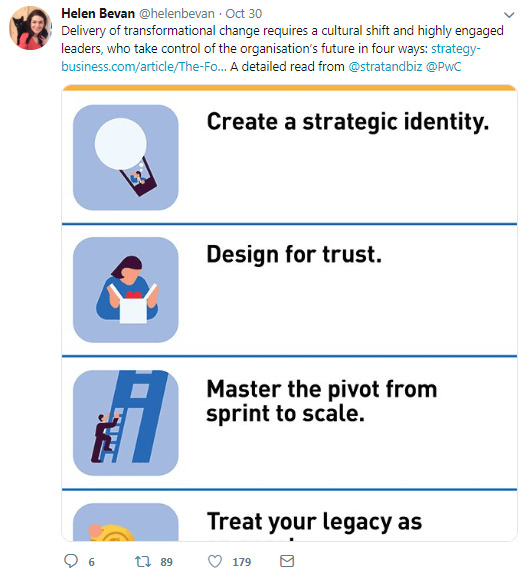 Delivery of transformational change requires a cultural shift and highly engaged leaders, who take control of the organisation's future in four ways. 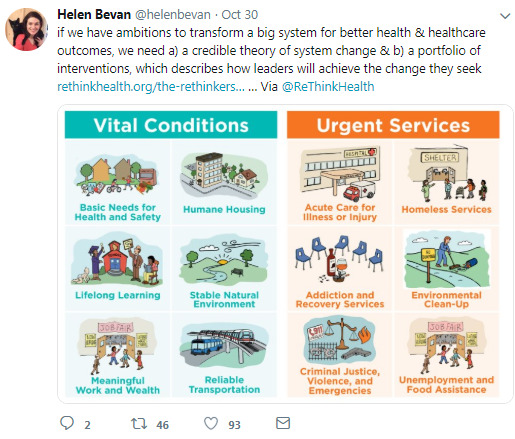 If we have ambitions to transform a big system for better health and healthcare outcomes, we need a credible theory of system change and b) a portfolio of interventions, which describes how leaders will achieve the change they seek. The Horizons team has undertaken a "climate survey" with many teams at different levels of the NHS. 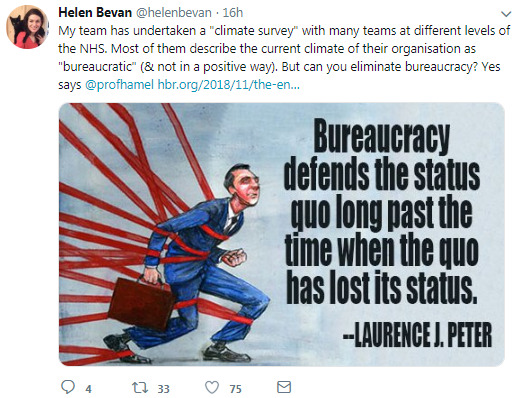 Most of them describe the current climate of their organisations as "bureaucratic" (and not in a positive way). Can you eliminate bureaucracy?